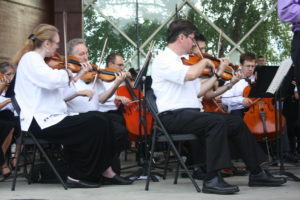 Tuesday, July 3, 2018 at 8:40 p.m.
Every two years, the Bloomington Symphony Orchestra gets to ring in Independence Day with a performance at the City of Bloomington’s Summer Fete celebration. Manny Laureano will lead the musicians of the BSO in a program of music sure to delight audience members of all ages with a variety of musical genres and eras. Bring a lawn chair or a blanket and pack a picnic or buy food from the onsite food trucks. Come early to get the best view of the orchestra and then stay after the BSO’s performance for one of the best fireworks displays in the state of Minnesota! The view from the lawn is great!